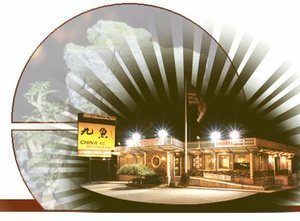 Update (09/10/2007): China 46 has closed for good. China 46 opened in 2001. we discovered it the day after Christmas of that year. Since then, I've probably eaten about 150 meals there. Let's just say I like China 46. From my first meal there on 12/26/2001 in the afternoon, all alone in the dining room, to my most recent meal there tonight, China 46 stuns, amazes, and provides what is definitely the most satisfying food that I've ever had. And it does it over and over and over. I can't say that about any other restaurant. And with their specialty of Shanghai style cooking, it's really one-of-a-kind (essentially) in NJ, and quite frankly it's better than any of the Shanghai places in NYC. Tonight's spur-of-the-moment meal was so perfect, so wonderful, that we were left wondering why we don't have meals here every other night. I honestly think we wouldn't tire of it. We were in the mood for something spicy, and asked the owner (and host) Cecil what he'd recommend. We specified that we preferred pork. Cecil went to the kitchen and came back offering the pepper and salt pork chops, which are on the menu. We've had the pepper and salt shrimp many times, and always enjoy it. The pork chop with this treatment was new to us (or perhaps we've had it but forgot as it had been so long?). The pepper and salt dishes (both the shrimp and pork chops) are served with shredded peppers that are somewhat hot, sliced raw garlic, and cilantro. The protein is usually lightly coated with a salty mixture and quickly deep fried. It's always a crowd pleaser, and the thinly sliced pork chops sure pleased this crowd of two tonight. We started with lamb dumplings, which are on the specials menu (located at the front door on a big board). The ground lamb has bits of crunchy vegetables, and the dumplings are served with a vinegar/soy dipping sauce. For a tiny little bit of lamb, this is some of the lambiest lamb dumplings I've ever had. The staff also brought out some hot chili paste, made with sichuan peppercorns (more on them later). This stuff is *hot*. Fresh bamboo and shitake was our vegetable dish tonight. If you've never had fresh bamboo you should. the texture of this dish is reason alone to order it: crunchy and fresh. Cecil was kind enough to bring out a small portion of another dish for us to try. He explained that it consisted of cured chinese long beans (chinese long beans are string beans that are about 2 or 3 feet long, often found in thai cooking), minced pork, some thai chilis, and maybe a bit of herb or scallion. This mixture is stuffed into little buns. Even though the ingredients list seems straight-forward, this dish blew me away. Clearly it's more than the sum of its parts. Those four dishes created one of the best meals I've ever had at China 46. Simply incredible. Oh, and at 34 dollars, I mean really. You have to be kidding me. (note that the sample of the pork/long bean was on the house). China 46 is BYO and open every day of the year. They have an incredible sunday "brunch", which, at about 12 dollars, is the biggest steal anywhere. anywhere. I'd say stick to sweet wines or beer with your meals at China 46. I usually bring Riesling. The heat and flavors in the spicy dishes will take most wines (steely wines especially) and shred them up into a big pile of tinny scrap metal. Not a good pairing. I'm definitely of the thought that you need a somewhat sweet wine with spicy dishes. And it's not just the spice that's wreaking havoc with the wine and your tastebuds: it's the sichuan peppercorns. For those who never had these little dried flowers, I'll say that they not only provide heat, but also a numbing affect to the lips and tongue. A delicious and unique flavor/sensation, and quite deadly for most wines. In a pinch, there's a liquor store right on Grand Ave directly north of Route 46.